You ask most business people if they’d hand the keys to their company over to three authors for a day and I think you’d get a fairly nervous laugh in response. "Now, the door can stick a bit, you may need to give it a kick"
But independent booksellers are generally a bunch keen to embrace different, mad event ideas. And keen for anything that cements the relationship between authors, publishers and bookshops – three elements that should have the same goal, but don’t always work together as well as they might. As we do dozens of school events every year we know children’s authors are regularly encouraged to go out and meet potential readers, we were fairly confident that the three authors, Paula Harrison, Fleur Hitchcock and Helen Peters, would make a pretty good job of stepping into our shoes and being booksellers for the day. "Why thank you, madam. And can we interest you in a Nosy Crow goodie bag?" Even so, we regularly take on work experience children from local schools and know that the person with the least experience is always the person who gets approached with the ‘I need a present for an uncle who lived in India and has now taken up bird-watching’ type of customer enquiry. The credit card that is refused. The person who wants to buy six mugs and wants them all wrapped and can she pay with a book token? So we batted around a few ideas of what our customers and our authors might really want to get out of the day (cake seemed to be the main response), so we hit upon also doing a couple of informal tea party meet-the-author sessions, in case they needed a break from the till and the questions in the afternoon. Of course you can have a basic plan, but when you do a totally different event it is impossible to know how it’s all going to go, so the main aim of the day was to stay flexible and to go along with what our guest authors felt most comfortable with. But we just fell in love with the idea that three authors were interested enough to want to see behind the scenes at a bookshop that they offered to volunteer their services for the day. We discovered we’d picked an incredibly hot day, so thanks to Sally Poyton for the impromptu gazebo. Our courtyard garden suddenly felt a bit like a place to regally take tiffin (see, we really did need all that cake). Paula Harrison got down to some tiara and animal-mask making workshops, Helen Peters was dragged off for an author interview. Fleur Hitchcock stepped up to do first stint on the till. And it was Fleur Hitchcock in particular who really won her bookselling spurs on Saturday. Honestly, you’d think she’d been doing it all her life. That ability to tune into every customer is crucial. For every hundred people who come through the door, you will get a hundred different requests and need to be able to find an answer for every one. One of the skills of being a bookseller is definitely being able to listen as well as expertly recommend. One person’s ideal ‘nothing too light’ will be more Philippa Gregory than Hilary Mantel and you have to be able to tune in. We know what people come to independent traders for – mostly for expert advice. And Fleur was just brilliant with those ‘my son is a huge reader and he has read everything – where do I go next’ queries and turning despair into a new pile of exciting reading opportunities. Bravo Fleur - the job is yours. 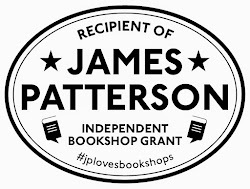 Independent Booksellers Week is a terrific initiative for everyone to go ‘Strictly Come Bookselling’ and volunteer to help out in your local bookshop for a day. whilst under attack by Klingons..."
What a great way to promote goodwill and understanding between authors and the people who sell their books. Selling books on the high street is tough. There is no getting away from it. We daily get author requests for help to sell their book. 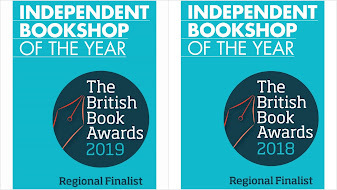 For any author who has phoned up for an event request and we respond with less cheer and more 'it can be difficult to get an audience' and then says: ‘but you just stick up a poster in the window’ – I now have my suggestion – go and do Strictly Come Bookselling at your local bookshop. And hopefully it will be interesting, informative and fun. Dig behind the scenes and discover what bookselling is all about. What did we learn from having guest booksellers for the day? I definitely took away that I can probably hand-sell more classics. We tend to be focused on the new: we read, read, read everything new that comes out, analysing debut authors, making sure we stock enough to satisfy demand for current trends and making sure we know about the books that everyone is talking about – as well as hand-selling and championing the ones we love. I hope the authors enjoyed their chance and felt they got a good look behind the scenes. I hope they loved the chance to listen and talk to the sort of queries and problems our customers come to every day, because talking to customers about books is one of the best things about the job. And if we get several people coming in asking us for ‘less fantasy, more reality', then that’s what we tend to seek out to stock. Like any small shop with limited shelf space, every book has to earn its place - but there are still gaps where we know we could sell more more more. There was the moment in the afternoon. A lull. And the authors all breathed a sigh of relief. That, of course, is the moment the booksellers go into overdrive, checking no urgent customer orders have come in on email or by phone, or attending to any queries you parked earlier because you didn’t have the time. All your orders are ready to go so that the one that absolutely has to come in next day is placed with the supplier most likely to fulfil the order. And if stock levels at the supplier were over 30 at the beginning of the day and are now zero, you have to move enough of the day’s order over to the supplier that still has stock - otherwise you won’t be able to trigger your next-day delivery. And you will create that dreaded disappointment in your customers. or should we just invoice you? Thank you so much to all three of our authors who gave their time for our customers and made them feel very special and welcome. And stayed right until the end of the day to make sure all those people who were keen to meet them but couldn’t make it earlier weren’t disappointed. Thanks for bringing all the cakes! The day was over before I knew it and I didn't manage to find the time to sample any, but they looked delicious. Thank you also for finding time to do author interviews in between all the work on the till. We’ve already had great feedback from those who came along and the relaxed format of being able to meet an author informally in the shop worked really well and was really appreciated. Thanks also to Nosy Crow for all their support, including Editorial Director Camilla Reid, who brought along our two youngest members of the Nosy Crow takeover day – her two daughters, who turned out to be experts on the till. And finally, to another young helper, Beatriz Poyton, who did everything from blowing up the balloons to helping on the till and was a real bookseller for the whole day. Only a few more years before she can start to do work experience for us, and - believe me - she's down on the list already!